Becoming a Global Civilization citizen. Criteria to obtain the Global Community Citizenship. Positive and constructive actions in sustaining Global Civilization, all life, and in good governance and management of the Earth. Employment for every global citizen. Protection of the global life-support systems and ecosystems of our planet. Certified Corporate Global Civilization Citizenship. Citizenship of Global Civilization, which will exist by virtue of a Treaty between nation governments and Global Parliament, is conferred on everyone who is a citizen of a Member State. Global Civilization citizenship is additional to, and does not replace, national citizenship. Election by universal suffrage when conducted by all Member States, will give the Global Parliament full legitimacy. By voting in its elections the citizens of Global Civilization enhance its status and influence. - the right to address any of the Global Community institutions or bodies in one of the official languages and to receive an answer in the same language. Members of Global Parliament (GP) will be elected by direct universal suffrage at five-year intervals. They will be elected under a system of proportional representation. Elections are held either on a regional basis, or under a mixed system. 3. the principle of the secret ballot. Members of Global Parliament must declare in a public register their professional activities and any other paid work or office held. They must also declare their financial interests and other sources of income. All peoples on Earth have been wondering what will it take to create and obtain a global community citizenship that is based on fundamental principles and values of Global Civilization. Now is time to enact your dream! It is time because humanity has no time to waste as we have done in the past. It is time to be what we are meant to become to save us and all life along with us. It is time to be citizens of the Earth. It is time to gather our forces and to stand for our global values, the only humane values that can save humanity and life on the planet from extinction. You may be eligible to become a citizen of Global Civilization. Global Civilization citizenship is given to anyone who accepts the Criteria of the Global Community citizenship as a way of life . It is time now to take the oath of global citizenship. We all belong to this greater whole, the Earth, the only known place in the universe we can call our home. Before you make your decision, we are asking you to read very carefully the Criteria of Global Civilization citizenship, make sure you understand every part of the criteria, and then make the oath of belonging to the Global Community, Global Civilization. You do not need to let go the citizenship you already have. No! You can still be a citizen of any nation on Earth. The nation you belong to can be called 'a global community'. But you are a better human being as you belong also to Global Civilization, and you have now higher values to live a life, to sustain yourself and all life on the planet. You have become a person with a heart, a mind and Soul of the same as that of citizens of Global Civilization. Negotiations with the United Nations are under way concerning worldwide acceptance of the Criteria of Global Civilization citizenship. It is expected that the U.N. accept worldwide Global Civilization citizenship and the Certified Corporate Global Community Citizenship (CCGCC). A Global Civilization citizen could travel the world with the global community VISA and work in nations where the VISA is obtained. The statement of rights and responsibilities of a person and of belonging to 'a global community' and to Global Civilization. d) We are citizens of Global Community, Global Civilization. We need to take this stand for the survival of our species. 2. Acceptance of the concept of 'a global community'. The concept of 'a global community' is part of the Glass Bubble concept of a global community. The concept was first researched and developed by the Global Parliament and was summarized on Global Parliament website. Then it was further researched and developed by Global Parliament and results obtained were published in February 2003 Newsletter and further developed over the past years with latest findings published in June 2017 Newsletter. We have already said that 'a global community' is not about a piece of land you acquired by force or otherwise. A typical global community may be what a group of people, together, wants it to be. It can be a group of people with the same values. It can be a group of people with the same cultural background, or the same religious background. One could think of a typical global community of a million people that does not have to be bounded by a geographical or political border. It can be a million people living in many different locations all over the world. Global Community is thus more fluid and dynamic. Global Civilization is this great, wide, wonderful world made of all these diverse global communities. We need to let go the archaic ways of seeing a community as the street where we live and contained by a border. The people making a global community may be living in many different locations on the planet. It can be a village, or two villages together where people have decided to unite as one global community. The two villages may be found in different parts of the world. It can be a town, a city, or a nation. It can be two or more nations together. We can no longer perceive ourselves as a People who could survive alone and a People who does not need anyone else. We belong and depend to this much larger group, that of Global Civilization. The 21st Century will see limitless links and symbiotical relationships with and within Global Community. A global symbiotical relationship between two or more nations, or between two or more global communities, can have trade as the major aspect of the relationship or it can have as many other aspects as agreed by the people involved. The fundamental criteria is that a relationship is created for the good of all groups participating in the relationship and for the good of humanity, all life on Earth. The relationship allows a global equitable and peaceful development. The emphasis of a global symbiotical relationship is not so much on how much money a nation should have or how high a GDP should be although money can be made a part of the relationship. We all know developed countries live off developing countries so the emphasis has no need to stress out the profit a developed nation is making off a developing nation. The emphasis of the relationship should give more importance to the other aspects such as quality of life, protection of the environment and of the global life-support systems, the entrenchment of the Scale of Global Rights and Global Constitution into our ways of life, justice, peace, cultural and spiritual freedom, security, and many other important aspects as described in the global ministries (health, agriculture, energy, trade, resources, etc.). 3. Acceptance of the Scale of Global Rights. To determine rights requires an understanding of needs and reponsibilities and their importance. The Scale of Global Rights and the Global Law were researched and developed by Global Parliament to guide us in continuing this process. The Scale shows social values in order of importance and so will help us understand the rights and responsibilities of global communities. 4. Acceptance of Global Constitution to deal between us all. Global Constitution is a declaration of interdependence and responsibility and an urgent call to build a global symbiotical relationship between nations for global sustainability. Global Civilization has focused people aspirations toward a unique goal: humanity survival now and in the future along with all Life on Earth. The "Belief, Values, Principles and Aspirations of Global Civilization" of Global Parliament's Constitution are closely interrelated. Together they provide a conception of global sustainability and set forth fundamental guidelines for achieving it; they were drawn from international law, science, philosophy, religion, and they were discussed as research papers during the global dialogues. 5. Acceptance of your birth right of electing a democratic government to manage Earth. The political system of an individual country does not have to be a democracy. Political rights of a country belong to that country alone. Democracy is not to be enforced by anyone and to anyone or to any global community. Every global community can and should choose the political system of their choice with the understanding of the importance of such a right on the Scale of Global Rights. On the other hand, representatives to Global Parliament must be elected democratically in every part of the world. An individual country may have any political system at home but the government of that country will have to ensure (and allow verification by Global Parliament) that representatives to Global Parliament have been elected democratically. This way, every person in the world can claim the birth right of electing a democratic government to manage Earth: the rights to vote and elect representatives to form Global Parliament. 6. Acceptance of the Earth Court of Justice as the highest Court on Earth. Global Civilization is promoting the settling of disputes between nations through the process of the Earth Court of Justice. Justice for all is what we want. Justice without borders! The Earth Court of Justice will hear cases involving crimes related to the global ministries. It will have the power to rule on cases involving crimes related to each one of the ministries. Prosecuting criminals on the basis of universal jurisdiction regardless of a territorial or nationality nexus required a solid commitment of political will from national governments and Global Civilization. Once in effect, the Earth Court of Justice will become the principal judicial organ of Global Civilization. The Court will have a dual role: to settle in accordance with international law the legal disputes submitted to it by national governments, local communities, and in some special cases by corporations, non-government-organizations and citizens, and to give advisory opinions on legal questions referred to it by duly authorized organs and agencies. * crimes stemming from the global ministries. The Earth Court of Justice will also rule on global problems and concerns such as the creation of a new nation in the world, and disputing territories or land between nations. * the criteria of becoming a Global Civilization citizen. The Statute of the Earth Court of Justice will be established later. The Earth Court of Justice established by Global Constitution as the principal organ of Global Parliament shall be constituted and shall function in accordance with the provisions of the Statute. These are actions learned from previous Global Dialogues. In Global Dialogue 2018, participants from all sectors of life will describe and explain actions that they have performed in their own homes, communities, business places or in any other places on the planet. Depending on whether we find a sponsor to promote Global Dialogue 2018, we hope to be able to present your videos, CDs or other productions on our website. Global Civilization has created the Climate Change Ministry, the Earth Ministry of the Environment, and offer national governments all over the world to coordinate efforts in implementing Global Civilization Action Plan with regard to climate change. There are thousands of actions everyone in Global Civilization could take right now. 2) Aboriginal Peoples as well as everyone else in the world have noticed that the climate has changed over the past years. They came forward (actions) and said that they too had observed climate changes over the past years and generations. In some countries the temperature has increased by one or two degrees and natural catastrophes are becoming more and more frequent. Flooding or freshwater scarcity as well as water pollution are harming the global environment and the global life-support systems. Therefore, all regions are facing a common problem which is linked to climate change, that's why we should negotiate honestly and find a compromise as quickly as possible. If no solution is suggested, developed countries like the USA will repeat the same mistakes as the developing world. In 2016, President Donald Trump announced that the United States was withdrawing from signing the Paris Agreement on climate change, thus causing widespread condemnation in the European Union and many sectors in the United States. World industrial activity, especially in the USA, is now profoundly affecting the atmospheric environment. It is now the population number and industrialization that makes the major impacts on the atmosphere. The most important changes affecting the atmosphere are due to the growth in the burning of fossil fuels. The burning of fossil fuels critically and destructively increases carbon dioxide concentrations and air pollutants. The clearing of forested lands for agriculture and other purposes, and forest fires, have reduced the amount of carbon absorbed by forests and contributed to the increase of atmospheric carbon dioxide. We have disturbed a fragile balance by causing chemical changes in the global atmosphere. And that is the most important factor causing the climate to change uncontrollably. Urban air pollution is a mixture of several pollutants emitted from different energy and industrial processes, and of secondary pollutants in the atmosphere. Some air pollutants are more important than others. At a given concentration some pollutants are more toxic or more unpleasant. Pollutants have different effects related to health, ecosystems, economics and aesthetic. Global Civilization offers the world to manage water, air and land pollutants. 3)	Tropical tree plantations may be an important component of the global carbon cycle because they represent a carbon sink that can be manipulated by humans and they ca mitigate the effects of tropical deforestation, which is the main biotic source of atmospheric carbon. 5)	The Paris Agreement is the latest step in the ongoing United Nations' effort to address global warming. The effort began with the United Nations' Framework Convention on Climate Change (Convention) signed during the Earth Summit in Rio de Janeiro in 1992. (The Convention entered into force in 1994 upon the ratification by 50 nations) Despite the continuing scientific debate on the likely occurrence of global warming, the nations took action under the "precautionary principle" of international law. Global Civilization offers to manage all natural resources. We need to create a Global Ministry for the economic sharing, production and distribution of resources, especially global resources such as minerals, oil and natural gas. 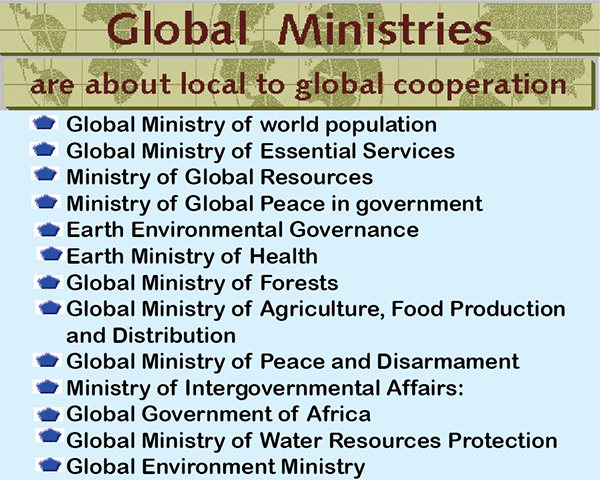 We need global ministries for the most important commons. With natural resources held in a Commons Trust Fund for all, it would be much easier to establish a global sharing economy, which is to equalise global consumption levels so that world population can flourish within ecological limits. To achieve this, over-consuming countries need to significantly reduce their natural resource use, while developing countries must be able to increase theirs until a convergence in global per capita consumption levels is eventually reached. d) We are members of Global Civilization. In year 2024, we are not asking here a woman to have only one child like is done in China. No! First of all it does not work in China. The Chinese population is still increasing. We are asking here to give a woman the choice, the freedom to say no I dont want children, or yes I want to raise a family, and to make that socially acceptable. For this to work, women must also be given equal rights to men in every way. The Chinese family policy does not work because women were not given the freedom to choose for themselves and the equal rights to men. Women are 'persons' just like men. Those men and women who choose to raise a family (one or more than one children, preferably more than one child) will be given all the help society can give them. The effect of such change in behavior will imply a true acceptance of belonging to Global Civilization and that humanity must step forward as a responsible body for the good of all. The heart, mind and human spirit of Global Civilization will want to be in the forefront of positive actions and human activities to ensure our survival. This is not new. In many parts of the world a man is no longer seen as the 'head of the family', the 'provider'. In year 2024, both men and women have taken that role depending of circumstances and social factors. Women are no longer seen as subservient persons and breeding machines. Women are seen as equal to men. Women's rights protect the equality between a man and a woman. In year 2024, Global Civilization has long recognized that greater equality between men and women is an essential element of slowing down world population growth. It was observed that fertility rates were falling everywhere women were allowed to determine when and whether they will have children. Gender inequality also impacts on resource use and the prospects for sustainability and biodiversity protection. Training and education along with their greater sense of nature ans shelter protection give women the tools they need to make resource use more equitable and efficient within communities and to mobilize against environmental and health hazards. e) access to modern methods of contraception and reproductive health services. Obviously something has to be done! Global Civilization proposes a tight global policy, benignly implemented, or it will be very nasty indeed. In practice, a human population of 10 to 12 billion would be too uncomfortably high and would add a high strain on world resources. What kind of world population would be reasonable? What goal should we aim at? A population should be small enough to be sustainable indefinitely and still allow plenty of leeway for ourselves and other lifeforms. It should also be large enough to allow the formation of healthy civilizations. In year 2024, comprehensive population policies are an essential element in a world development strategy that combines access to reproductive health services, to education and economic opportunities, to improved energy and natural resource technologies, and to healthyer models of consumption and the "good life." In year 2024, more and more young people on every continent want to start bearing children later in life and to have smaller families than at any time in history. Likewise, in greater proportions than ever, women and girls in particular want to go to school and to college, and they want to find fulfilling and well-paid employment. Helping people in every country obtain the information and services they need to put these ambitions into effect is all that can be done, and all that needs to be done, to bring world population growth to a stable landing in the new century. Global Civilization needs to develop a more exciting synergy between sustainable development, consumption and family well-being. New concepts (the human family, human responsibilities, human security, citizenship education) and old concepts (quality of life, well-being, justice and standard of living) have been combined in conjunction with a comparative analysis of the alternative approaches to the GDP as a way to bring together a collection of viewpoints to understand a family perspective in sustainable consumption and development. World overpopulation at the turning point requires each and every one of us to take a stand on rights and on being a part of Global Civilization. In year 2024, scientists have become more involved in assessing the viability of response options aimed at storing excess carbon in terrestrial or ocean systems. Land use changes from agricultural to forest ecosystems can help to remove carbon from the atmosphere at rates of 2 to 20 tonnes of carbon per hectare per year for periods of 50 years or more, until a new ecosystem equilibrium is reached. Similarly, soil conservation practices can help build up carbon reservoirs in forest and agricultural soils. Proposals to extract CO2 from smoke stacks and dispose of it in liquid form in underground reservoirs or deep oceans also need careful evaluation in terms of long-term feedbacks, effectiveness and environmental acceptability. However, much remains to be learned about the biological and physical processes by which terrestial and ocean systems can act as sinks and permanent reservoirs for carbon. Global Civilization also proposes that all nations of the world promote the Scale of Global Rights and the criteria to obtain Global Community Citizenship. Every global citizen lives a life with the higher values described in the Scale and the criteria. Global citizens are good members of Global Civilization. Most global problems, including global warming and world overpopulation, can be managed through acceptance of the Scale and the criteria. In year 2024, the world has become global in most fields of life. Nowadays it is a necessity to co-operate in resolving global problems which makes global governance a quality of Global Civilization. The next most important achievement of Global Civilization will be the signing of a global agreement for the implementation of the Scale of Global Rights. Over its long past history trade has never evolved to require from the trading partners to become legally and morally responsible and accountable for their products from beginning to end. At the end the product becomes a waste and it needs to be properly dispose of. Now trade must be given a new impetus to be in line with the global concepts of Global Civilization. You manufacture, produce, mine, farm or create a product, you become legally and morally responsible and accountable of your product from beginning to end (to the point where it actually becomes a waste; you are also responsible for the proper disposable of the waste). This product may be anything and everything from oil & gas, weapons, war products, to genetically engineered food products. All consumer products. All medicinal products! All pharmaceutical products! In order words, a person becomes responsible and accountable for anything and everything in his or her life. We want to help you be an active corporate member of Global Civilization. Apply to us to be a global corporate citizen of Global Civilization. Now is time to reach a higher level of protection of life on Earth. We all need this for the survival of our species. We can help you integrate and balance global life-support systems protection, global community participation, and economic decisions into your operations and products. We want to help you be an active corporate member of Global Civilization. Apply to us to be a global corporate citizen of Global Civilization. A Certified Corporate Global Civilization Citizenship is a unique way to show the world that your ways of doing business are best for Global Civilization. You can obtain the citizenship after accepting the Criteria of Global Civilization Citizenship and following an assessment of your business. You are then asked to operate your business as per the values of the citizenship. It is a crime against humanity and all life on Earth not to ratify the Kyoto Protocol, and the Paris Agreement in 2016. It is a terrible crime against the global life-support systems, against the very existence of the next generations. On the Scale of Global Rights the crime is of maximum importance. There is no need to wait for the election of Global Parliament to create the Earth Court of Justice. The Court can be formed now and incorporated to Global Parliament later. The world is too crowded and too small nowadays! And weapons too lethal! So security cannot be achieved through the military. The only job the military should be asked to do today is to protect the global life-support systems. These systems have the highest priority on the Scale of Global Rights and are certainly more important than any of the other rights on the Scale including security. Simply because without life there is no other right possible. Without Oxygen there is no life! Without clean water there is no life! So protect life on Earth at all costs. Wars are the biggest threat to life and the ecosystem of the planet. The production and trade in arms should be listed as a criminal act against humanity; this global ministry will introduce a Convention on the curtailment of the arms trade, a provision for a mandatory Arms Register and the prohibition of the financing or subsidy of arms exports by governments. The Earth Court of Justice has listed America as the first nation to be prosecuted for a global environmental crime. Because the leader of the USA was responsible for not signing the Kyoto Protocol, President George W. Bush will be first to appear in Court. He is an evil man. In comparison, he makes Adolf Hitler and Saddam Hussein look like kids in the block. The splitting of America into separate independent states living at peace for the good of all worldwide would certainly be a better solution to all Americans and the world. The reality here is that every American is on trial here. A large majority of the consumers in USA are also responsible for producing the deadly greenhouse gases from the burning of fossil fuels causing global warming, and they are all on trial. The same goes for every person on Earth producing the deadly gas. The gas is just as deadly as the gas that murdered millions of Jews during World War II. It is even more deadly as it is destroying the global life-support systems of all life on Earth. We are killing billions of human beings and countless life species. Americans have closed their conscience to the reality of life on Earth. They have no global consciousness. Justice must prevail to stop the "killing fields". And therefore they are guilty as charge. It is a crime against humanity and all life on Earth not to ratify the Kyoto Protocol and the Paris Agreement which entered into force on 4 November 2016. It is a terrible crime against the global life-support systems, against the very existence of the next generations. On the Scale of Global Rights the crime is of maximum importance. There is no need to wait for the election of Global Parliament to create the Earth Court of Justice. The Court can be formed now and incorporated later to Global Parliament. Prosecuting criminals on the basis of universal jurisdiction regardless of a territorial or nationality nexus required a solid commitment of political will from national governments and Global Civilization. Once in effect, the Earth Court of Justice will become the principal judicial organ of Global Civilization. The Court will have a dual role: to settle in accordance with Global Civilization international law and the legal disputes submitted to it by national governments, local communities, and in some special cases by corporations, non-government-organizations and citizens, and to give advisory opinions on legal questions referred to it by duly authorized organs and agencies. The Earth Court of Justice will handle environmental damage cause by the U.S. military action. Global Civilization has classified the damage as a criminal liability for military personnel and/or their contractors. The war industry has become a liability to humanity. * the development of military capabilities is a potential threat to the security of people and all life on Earth; the ministry will make the demilitarization of global politics a high priority. * over the past decades and even now today, all Five Permanent Members of the United Nations Security Council (mostly the United States and Britain) were responsible for selling weapons and war equipment. These three nations are required to give back to Global Civilization an amount of 8 trillion dollars (American) as a payment for the immense damage they have caused in the world. They have created a culture of violence throughout the world. They are nation bullies, nation predators. They are responsible for economic mismanagement, ethnic tensions, crimes, drug abuse, high unemployment, urban stress, worldwide poverty, and pressures on natural resources. Most conflicts in the world are direct legacies of cold war power politics, senseless politics. Other conflicts were caused by the end of the cold war and the collapse of old regimes. Other factors have combined to increase tension: religious, economical, political, and ethnic aspects. In the past, security was thought as better accomplished through military means. Expanding the military capabilities and forming alliances with other nations were the only way to 'win'. Today wars are unlikely to produce winners. Global Civilization is all over the planet. Ethnic groups are everywhere. Some say there are more Italians in Montreal, Canada that there are in Italy. So we would fight our own people? Wars truly make no sense! The world is too crowded and too small nowadays! And weapons too lethal! So security cannot be achieved through the military. The only job the military should be asked to do today is to protect the global life-support systems. These systems have the highest priority on the Scale of Global Rights and are certainly more important than any of the other rights on the Scale including security. Simply because without life there is no other right possible. Without Oxygen there is no life! Without clean water there is no life! So protect life on Earth at all costs. Wars are the biggest threat to life and the ecosystem of the planet. So security must be achieved by other means than wars. We might as well shelved the war industry from humanity right now and that means phasing out all nuclear, biological, chemical weapons right now. No waiting! That also means having inspectors verifying the phasing out in all nations of the world, and not just in some Middle East country. The nature of global security has changed since the rise of the Global Parliament. Security used to be about the protection of the state and its boundaries, people, institutions and values from an outside threat. Global Parliament will emphasize as a priority the prohibition of external interference in the internal affairs of sovereign states. Today the security of people within the Global Parliament is just as important as the security of states. Citizens must be secure. Global Parliament is just as important as the security and life of global citizens and states. Global security can only be achieved if it can be shared by all peoples and through global co-operation, based on principles as explained in the "Belief, Values, Principles and Aspirations of Global Civilization" of the Global Parliament's Constitution, such as justice, human dignity, and equity for all and for the good of all. All people and states are protected by Global Civilization. The spirit of global competition be changed to a spirit of global cooperation; over its long past history trade has never evolved to require from the trading partners to become legally and morally responsible and accountable for their products from beginning to end. Now trade must be given a new impetus to be in line with the global concepts of Global Civilization. You develop, manufacture, produce, mine, farm or create a product, you become legally and morally responsible and accountable of your product from beginning to end (to the point where it actually becomes a waste; you are also responsible for the proper disposable of the waste). This product may be anything and everything. allowing a global equitable and peaceful development and a more stable and inclusive global economy. In year 2024, Global Civilization is promoting a methodological approach to an economic valuation as a framework incentive to enforce profit-based conservation strategies for natural ecosystems. Biodiversity and Protected Areas exist neither in isolation nor independent of human activities. For local communities, this may mean conservation represents a hindrance rather than an opportunity for sustainable development and thus lead to increasing avoidance of the regulatory framework in effect. Changes are needed to conservation practices in order to create a broader consensus around objectives and practices. One means of doing this is to ensure people adopt profit-based conservation practices. Global Civilization is recommending to the developing nations not to make deals with the developed countries. Do not accept money as loans from the IMF and World Bank. Do not become a member of the WTO. Your best chance for survival is to build sustainable communities in your country. If you do need to make a deal with another nation, a symbiotical relationship based on economics, make sure it is for the interests of both of you. You have no need of a global membership on any kind. It would destroy you. 6. developing a method of raising global taxes, of redistributing incomes to the poorest communities, of providing debt-free technical assistance to non-industrial and developing countries to help them to meet environmental standards. In year 2024, over its long past history trade has never evolved to require from the trading partners to become legally and morally responsible and accountable for their products from beginning to end. At the end the product becomes a waste and it needs to be properly dispose of. Now trade must be given a new impetus to be in line with the global concepts of Global Civilization. You manufacture, produce, mine, farm or create a product, you become legally and morally responsible and accountable of your product from beginning to end (to the point where it actually becomes a waste; you are also responsible for the proper disposable of the waste). This product may be anything and everything from oil & gas, weapons, war products, to genetically engineered food products. All consumer products. All medicinal products! All pharmaceutical products! In order words, a person becomes responsible and accountable for anything and everything in his or her life. Carbon dioxide is one of the main culprits for greenhouse gases and the reduction of emissions of this toxic substance has become has become very important. 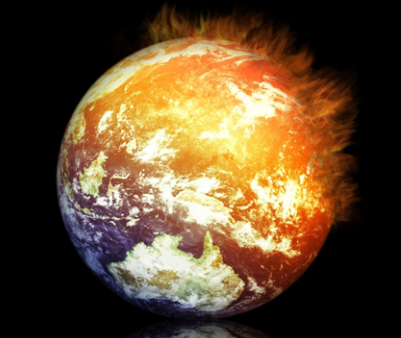 Greenhouse gases are released into the atmosphere by burning fossil fuels. Accelerated industrial activity in many developed and developing countries has dramatically increased the levels of these emissions in the air. Mass deforestation has also cut the globe’s ability to absorb these gases. The dilemma is how to find ways that permit the economic growth without jeopardising the environment. Canada along with other 37 countries has ratified the 1997 Kyoto protocol according to which the emissions of greenhouse gases were supposed to be reduced significantly by year 2012. It has adopted the policy of private-enterprise solutions to the global warming problem. More commitments were made during the Paris Agreement on climate change. As the date of reducing significantly the emissions of greenhouse gases was approaching, many wonder whether governments would ever consider the adoption of some measures to reduce the accelerated deterioration of the atmosphere. It was feared that the uncontrolled industrial activity may lead to a situation where further economic development would be impossible. Greenhouse gases believe to cause warming of the Earth’s climate, leading to erratic and destructive weather, melting polar caps and drought in already warm regions. The ecological equilibrium is in jeopardy. From a policy perspective the radical plan hammered out by politicians in Kyoto was the first concrete initiative to fix targets for a significant reduction of greenhouse gases. Although the timetable set for gases emissions reductions were considered by some too long and by others too short, the fact of the matter was that the countries which ratified the Kyoto protocol and the Paris Agreement on climate change, have not taken as yet any concrete and significant measures to the application of the agreement. Plausible questions arise as to the seriousness of politicians and policy makers to tackle this problem. Canada is a case in point. It has pledged, under the Kyoto agreement, to cut greenhouse gas emissions by 6 per cent from 1990 levels by 2012. It has opted to use a market approach where every ton of carbon dioxide that is removed from the atmosphere or prevented from being emitted is bought and sold on an exchange like the one that already exists in the U.S. for sulphur dioxide emissions – a market that is now worth an estimated $500-million (U.S.) in trade a year. Under such a regime overpolluters could offset their reduction obligations with credits. Demand and supply for credits would provide the appropriate incentives for reducing emissions. Actually, prices, as determined in the auction exchange market, would provide the appropriate signals for emissions reduction. A strong demand for market credits would push up the price of the units and create a powerful incentive for others to create more credits by devising innovative means of cutting emissions. Such an environmental regulation provides incentives for technological change and better environment. In year 2024, Global Civilization has formed a global ministry dealing only about agriculture and the protection of our soils. All nations will be part of the ministry. We have to design systems of food production that meet our own needs, and also leave room for these other lifeforms we want to take along with us. Western agriculture is designed in the end to maximize profit. As a primordial human right, the prime concern of the human species is to feed people. Therefore we have to do things differently. We will have to produce less livestock as we effectively double the population we need to feed: ourselves, plus the livestock that is supposed to be feeding us. We also have to apportion the land surface of the whole world more efficiently, using some for highhly intensive food production (which makes use of less land), some for extensive agriculture (combining food production with wildlife conservation) and designing some specifically as wilderness areas with global corridors between them. In year 2024, Global Civilization has given back responsibility to every global citizen on Earth. Everyone shares responsibility for the present and future well-being of life within Global Civilization. We will work together in working out sound solutions to local and global problems. It would be wrong and dishonest to blame it all on the leader of a country. Most problems in the world must find solutions at the local and global community levels (and not assume that the leader alone is responsible and will handle it). There is a wisdom in the ways of very humble people that needs to be utilized. Every humble person deserves to have ideas respected, and encouraged to develop his or her own life for the better. Sound solutions to help manage and sustain Earth will very likely be found this way. Everyone can help assess the needs of the planet and propose sound solutions for its proper management, present and future. Everyone can think of better ideas to sustain all life on Earth and realize these ideas by conducting positive and constructive actions. When there is a need to find a solution to a problem or a concern, a sound solution would be to choose a measure or conduct an action, if possible, which causes reversible damage as opposed to a measure or an action causing an irreversible loss; that is the grassroots process. Global Civilization can help people realized their actions by coordinating efforts efficiently together. In year 2024, Global Civilization believes all citizens have the right to share the wealth in the world. Foreign investment and the trade agreement must protect and improve social and environmental rights, not just the economy. A global sustainable development would mean finding a sound balance among the interactions designed to create a healthy economic growth, preserve environmental quality, make a wise use of our resources, and enhance social benefits. Free trade cannot proceed at the expense of the environment, labour rights, human rights and the sovereignty of a nation. Free trade will lead to an increase in poverty by giving investor rights priority over government decision-making. Employers will be looking for more concessions from workers. Small businesses will find it more difficult to grow and compete against large corporations. collaborate with global communities to save Earth ecosystems. Such a SD-information system was globally-integrated and territorially distributed. In order to bring about the creation of such an information system, it was essential to carry out a large-scale operation, requiring appropriate developments in science, technology and society at large. Due to the lack of such an information foundation for the global and local governance, a covert or overt struggle for access to scarce and shrinking natural resources will inevitably grow and accelerate the crisis. This crisis, if unchecked, will lead to a global catastrophe. The deficit of these resources should, and, we believe can, be eliminated through international cooperation, which should replace the existing competition. That, however, requires not only political will, but also the deepening of a comprehensive and easily accessible knowledge about the consequences of human actions and inactions. In year 2024, Global Civilization promotes a democratically planned global economy - Societal Sustainability - with built-in mechanisms for optimum input and oversight guaranteed to all nations. In year 2024, Global Civilization cooperates to manage sustainably energy and resources on a worldwide scale and provides the driving force for achieving and sustaining a planned global economy democratically embarked upon by all member-states of Global Parliament. Global Civilization offers a rational, effective response to impending trade wars and other instances of human despair arising from the contradiction between free trade practices and national job protectionism. Launching a democratically planned global economy at the earliest practicable time will bypass the thirty-year time frame projected for equalizing labor costs between underdeveloped national economies and those of the more developed national economies - while reversing the deterioration of social and environmental conditions traceable to an economic system increasingly antithetical to global unity and human aspirations. In year 2024, Global Civilization succeeded in evaluating options and strategies for adapting to climate change as it occurs, and in identifying human activities that are even now maladapted to climate and protect Earth ecosystems and the global life-support systems. Losses of biomass through deforestation and the cutting down of tropical forests put our supply of oxygen (O2) gas at risk. The Earth's forests did not use to play a dominant role in maintaining O2 reserves because they consume just as much of this gas as they produce. Today forests are being destroy at an astronomical rate. No O2 is created after a forest is put down, and more CO2 is produced in the process. In the tropics, ants, termites, bacteria, and fungi eat nearly the entire photosynthetic O2 product. Only a tiny fraction of the organic matter they produce accumulates in swamps and soils or is carried down the rivers for burial on the sea floor. The O2 content of our atmosphere is slowly declining. The content of the atmosphere decreased at an average annual rate of 2 parts per million. The atmosphere contains 210,000 parts per million. Combustion of fossil fuels destroys O2. For each 100 atoms of fossil-fuel carbon burned, about 140 molecules of O2 are consumed. 4.	practical solutions to help global citizens through the difficult time we are all experiencing. Global Civilization also proposes that all nations of the world promote the Scale of Global Rights and the criteria to obtain Global Civilization citizenship. Every global citizen lives a life with the higher values described in the Scale and the criteria. Global citizens are good members of Global Civilization. Most global problems, including global warming and world overpopulation, can be managed through acceptance of the Scale and the criteria. Comprehensive population policies are an essential element in a global development strategy that combines access to reproductive health services, to education and economic opportunities, to improved energy and natural resource technologies, and to healthyer models of consumption and the "good life." Sign-up to obtain the ECO Award in the business category, your Certified Corporate Global Community Citizenship (CCGCC) to show the world your ways of doing business are best for Global Civilization. In year 2024, Global Civilization has proposed to corporations that they take responsibility on behalf of society and people, and that they should pay more attention to Global Rights, working conditions and getting ride of corruption in the world of business and trade. We have developed a criteria, and we ask you to turn it into practice. Governments should encourage enterprises to use the criteria both by legal and moral means. At first, the criteria should be adopted in key areas such as procurement, facilities management, investment management, and human resources. Corporations want to be seen as good corporate leaders and have a stronger form of accountability. Business and trade will prosper after stronger common bonds and values have been established. Adopting the criteria will have a beneficial impact on future returns, and share price performance. Obtaining one ECO will help businesses to be part of the solution to the challenges of globalisation. In this way, the private sector in partnership with the civil society can help realize a vision: allowing a global equitable and peaceful development and a more stable and inclusive global economy. The Global Community Assessment Centre (GCAC) will guide you on how to better integrate criteria issues in your business. In the context of a healthy world sustainable development, companies will perform better and increase shareholder value by properly managing risks, anticipating regulatory action or accessing new markets. Tangible results of adopting the criteria include a better company reflected in its reputation and quality of brands. Obtaining one ECO is a tremendous asset to business owners, self-regulatory organizations, investors, brokers, regulators, stock exchanges, accountants, analysts, financial advisers, asset managers, and consultants. It will contribute to strengthen investment markets. Governance of the Earth makes the rule of arbitrary power--economic (WTO, FTAA, EU), political, or military (NATO)-- subjected to the rule of law within the global civil society, Global Civilization. Justice is for everyone and is everywhere, a universal constant. In year 2024, Justice is without borders. In year 2024, Global Civilization has no intention of changing the status and privileges of state governments. In fact, state governments become primary members of Global Parliament. 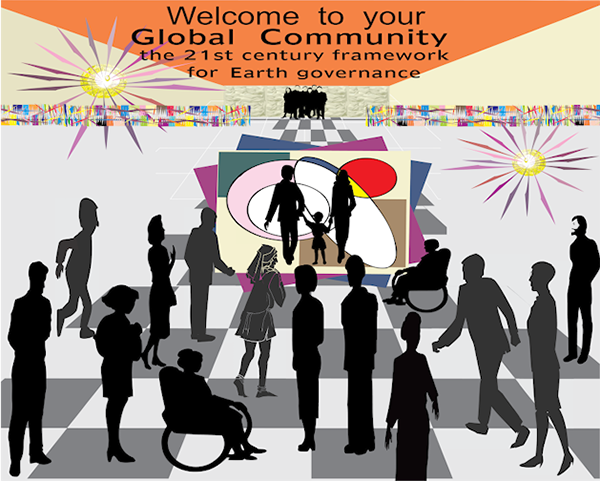 Global governance can only be effective within the framework of the criteria of the Global Community citizenship. In year 2024, Global Civilization was built from a grassroots process with a vision for humanity that is challenging every person on Earth as well as nation governments, and has a vision of the people working together building a new civilization including a healthy and rewarding future for the next generations. Global cooperation brings people together for a common future for the good of all. In year 2024, Earth governance does not imply a lost of state sovereignty and territorial integrity. A nation government exists within the framework of an effective Global Civilization protecting common global values and humanity heritage. Earth governance gives a new meaning to the notions of territoriality, and non-intervention in a state way of life, and it is about protecting the cultural heritage of a state. Diversity of cultural and ethnic groups is an important aspect of Earth governance. Earth governance is a balance between the rights of states with rights of people, and the interests of nations with the interests of Global Civilization. Earth governance is about the rights of states to self-determination in the global context of Global Parliament rather than the traditional context of a world of separate states. Now is time to reach a higher level of protection to life on Earth. We all need this for the survival of our species. We can help you integrate and balance global life-support systems protection, global community participation, and economic decisions into your operations and products. GCAC will be conducting the assessment of your business. GCAC is the assessment centre of the Global Civilization. It was created to give individuals, businesses or other organizations help and advice about negative events happening in their communities which cause concern to people, resources, industry or the environment. GCAC is also the Centre of assessment of local and global indicators about the four major quality systems: Environment, People, Economic Development and the Availability of Resources. The assessment of these indicators will result in giving Global Civilization a sense of direction as to ensure a sound future for Earth. In year 2024, in order to do this GCAC will continue to amass a body of scientific information based on formal assessments such as those on Biodiversity, Climate Change, Human Development Report, World Development Report, struggle for Global Rights, life species Conservation, Health, Economic Analyses, Commission on Sustainable Development, etc., which have bridged the distance between incomplete science and contentious policy. Local and global indicators developed by Global Civilization will also be used as basic scientific information. Furthermore, no one really understands what assessment processes have been most effective in the past, or why others have failed. GCAC’s goal is to explore how assessment of local and global indicators can better link scientific understanding with the progressive implementation of effective policy solutions to global changes. Achieving this integration is fundamental. Global Civilization needs this annual assessment to effectively manage global changes. GCAC conducts an annual assessment of the 'Global Civilization Overall Picture' which describes the situation in all nations of the world. The world was divided into five different regions: North America, Latin America & the Caribbean, Africa, Europe, and Asia & Oceania. Each assessment has a description of what is happening in the different regions. They are actual facts concerning issues we have discussed during previous global dialogues. Issues between now and the coming Global Dialogue in 2018 are also included in this project. Our work is too create a plausible scenario(s) of what the world could be between now and 'a not-so-distant-future'. This project will help humanity understand itself better. Certainly our work is sound. We have already produced very valuable and original tools to help humanity: the Vision of Earth in Year 2024, the Scale of Global Rights and Global Parliament's Constitution, the Earth Court of Justice, global ministries, and we stood for the values we promoted no matter how difficult was the opponent. Now is time to expand our work for the good of all humanity. Global Civilization believes all citizens have the right to share the wealth in the world. Foreign investment and the trade agreement must protect and improve social and environmental rights, not just the economy. A global sustainable development would mean finding a sound balance among the interactions designed to create a healthy economic growth, preserve environmental quality, make a wise use of our resources, and enhance social benefits. Free trade cannot proceed at the expense of the environment, labour rights, human rights and the sovereignty of a nation. Free trade will lead to an increase in poverty by giving investor rights priority over government decision-making. Employers will be looking for more concessions from workers. Small businesses will find it more difficult to grow and compete against large corporations. In year 2024, Global Civilization promotes the adoption of world sustainable development and for strong international cooperation to achieve world sustainable development. Global cooperation can facilitate native people's acceptance of rational policies, financial assistances and advanced technologies provided by the international community and that international cooperation also can contribute to regulating world population distribution, improving low population quality of backward countries, protecting and exploiting natural resources, developing those products and industries which can cause lower consumption of natural resources and energy sources with light pollution of environment, and keeping environmental stability and ecological balance. In a word, international cooperation greatly contributes to world sustainable development. Earth environmental governance can only be achieved successfully within the larger context of sustainable developent and Earth management. All aspects are inter-related and affect one another. A healthy environment is essential to long term prosperity and well-being, and citizens in Global Civilization demand a high level of ecological protection. This is the 'raison d'etre' of the Scale of Global Rights . On the Scale, primordial human rights and the protection of the global life-support systems (ecological rights) are on top of the Scale. They are the most important aspects. Primordial human rights are those human rights that individuals have by virtue of their very existence as human beings: to live, have security, eat, drink fresh water, breath clean air, and have shelter. These rights are separate categories than the right of the greatest number of people, economic rights, social rights, cultural rights and religious rights. Ecological and primordial human rights are the only rights that have existed unchanged throughout the evolutionary origin of our species. Any major change would have threatened our very existence. All other human rights are rights created by human beings and can be changed depending of new circumstances; they are not stagnant but are rather flexible and adaptive, and they can evolve. Ecological and primordial human rights of this generation and of future generations are therefore much more important than any other human rights existing now and in the future. Ever since 1985, Global Civilization has developed and defined sustainable development and a mean of measuring it. Now we want the corporate world as well as everyone else, all consumers, to integrate and balance global life-support systems protection, global community participation, and economic decisions into your operations and products, and into your way of life and of doing things. Global Community WebNet Ltd. is a federal corporation of Canada. The corporation has sponsored the research and development of the global concepts of Global Civilization. It has sponsored all global dialogues since 1985. These global dialogues have resulted in the establishment of the criteria of the Global Community Citizenship and of the Certified Corporate Global Civilization Citizenship. Global Community WebNet Ltd. was the first corporation on Earth to qualify and obtain one ECO, the Certified Corporate Global Civilization Citizenship.